We know Scrooge would say "Bah Humbug!" but we are way too excited for the holidays to notice, especially when watching The Muppets Christmas Carol. 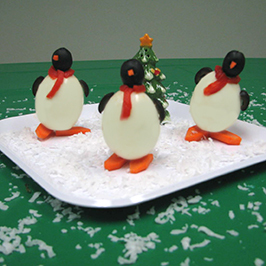 To celebrate our favorite Muppets, the penguins, try these penguin eggs! USE large end of oval egg as base for penguin. PLACE one toothpick in each of 2 baby carrots (trim carrots if necessary). STICK top of toothpicks into bottom of egg to form "feet" of penguin. These will stabilize egg. USE 1 olive for head of penguin. TRIM 1 mini carrot to form nose. CUT sliver in olive to insert carrot nose. INSERT toothpick into bottom of olive and place on top of egg to form "head" of penguin. CUT 1 olive in half lengthwise for "flippers". PLACE 1 half on each side of egg using toothpicks that have been broken in half. PLACE 1 strip of roasted red pepper around neck for a scarf. PLACE another strip of roasted red pepper down one side of penguin for drape of scarf. REPEAT process for each penguin. REFRIGERATE until using.